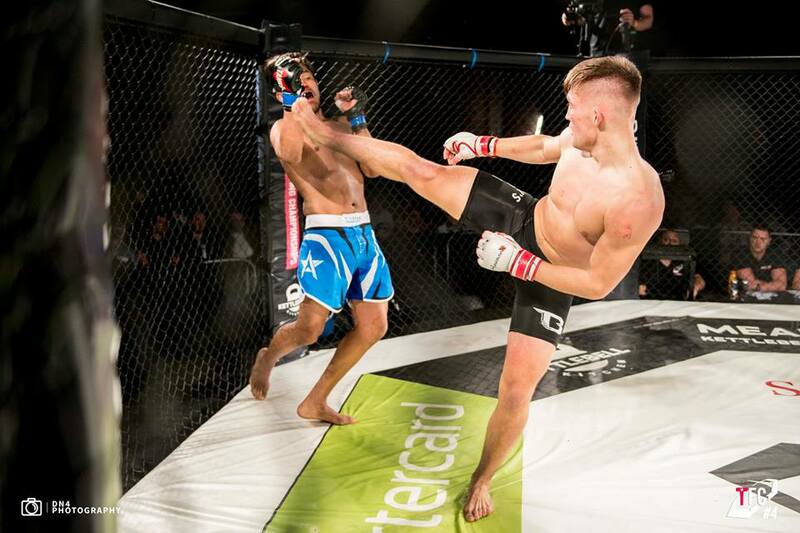 Newark’s Regis ‘The First’ Sugden showed he was more than ready to make up for lost time after a 20-month break when he returned to the cage on the Tanko Events TFC#4 show on Friday 12 May. Fighting for the first time at Featherweight on an action-packed card in Manchester’s Victoria Warehouse, the 21-year old Suggy’s Gym star added another victory to his pro MMA record with a unanimous win over Arturo ‘El Moreno’ Chavez. The Newark camp accepted the fight knowing it was always going to be a tough test for Regis. “After a long period of rehabilitation following major surgery on his ankle, many people would have expected us to look for a softer comeback,” said Suggy’s Gym head coach Dean Sugden. “But Regis was determined to send out a strong statement to the MMA world by getting straight back into the mix. When his original opponent pulled out with about four weeks to go, it seemed no UK-based fighters fancied their chances against Regis and the promoter was forced to look further afield. Born in Mexico but now based in Sweden and with a record of six wins from 10 fights, Arturo has never been stopped. His losses were all to very good opponents by razor-thin decisions so Regis, his corner and the 100-plus fans who travelled to Manchester to support him were ready for a tough and exciting clash. The atmosphere was electric as Regis walked out to the cage. Unfazed by the crowd’s reaction, Arturo came out fast and strong in the opening round, only to be rocked as Regis, showing no sign of cage rust, landed a series of pin-point accurate heavy punches and kicks. Being on the receiving end of some vicious low kicks prompted Arturo, who normally opts to stand in front of his opponents, to try and out-grapple Regis. But the Newark fighter’s grappling and ground at times looked better than his stand up and at the first bell Regis was one round up. Round two saw the Mexican again coming out to put Regis under pressure but he was met with yet more accurate striking and a round kick to the body which left him visibly hurt. Towards the end of the round, he moved in to grapple again; quickly back on his feet, Regis landed a vicious hook which sent his opponent reeling and, as he wobbled back to his side of the cage, it was clear that the bell had come just in time for Arturo. In the final round, Regis looked to miss quite a bit with his kicks and was beginning to show signs of tiring. Picking up on this, Arturo put it on Regis who now opted to grapple and go to the ground rather than stand, showing how much his ground game has come on. With Arturo mostly holding rather than progressing his position, Regis took the opportunity to rest and recover and both fighters finished the bout standing and swinging punches, with Arturo bleeding from a cut to his nose and Regis looking battle-worn. Before announcing the decision, the MC described the contest as the fight of the night and Regis and his supporters celebrated a tough but great win against a very game and credible opponent. Back in Newark after the show, Regis said: “Everybody out there knows just how much I love a scrap so having someone in front of me who could take my shots and get the rounds out made this a particularly good one, not only for me but for everyone who saw it too. “A big thank you to all those who made the trip to Manchester, to those who watched the live stream and of course to my sponsors BMA Homes, Aluminate, BillyOh, GoodFit Nutrition and Booster FightGear. “I’d love to do it again, to give Arturo another opportunity and give myself the chance to show what I’m really capable of. Maybe some of the other prospects out there might fancy it now; we already have a few offers on the table so you can expect an announcement before too long.